More than 100 homes and other buildings were threatened Tuesday by a trio of wildfires southeast of Missoula, but cooler temperatures and higher humidity levels, meanwhile, were expected to aid crews at those and other fires around the state. One blaze in western Montana, believed to have been deliberately set, forced the evacuation of about 40 homes along Interstate 90, reports CBS News correspondent Stephan Kaufman. Also threatened by flames are 40 more homes southeast of Missoula, while so-called extreme conditions are expected to continue fueling a large fire north of Helena in the Gates of the Mountains wilderness area. Organizers of the area's famed Testicle Festival said the five-day bacchanalia was still a go. The fire "has experienced extreme fire behavior, and it has spread very rapidly," National Interagency Fire Center spokeswoman Jennifer Smith told CBS News. 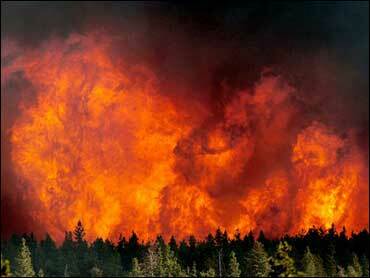 "The western states are still in a drought," said the fire center's Smith. "They've been in a drought for over 10 years now, and this year, we've received a lot of dry lightning in Montana and Idaho. That has sparked most of the significant fires."